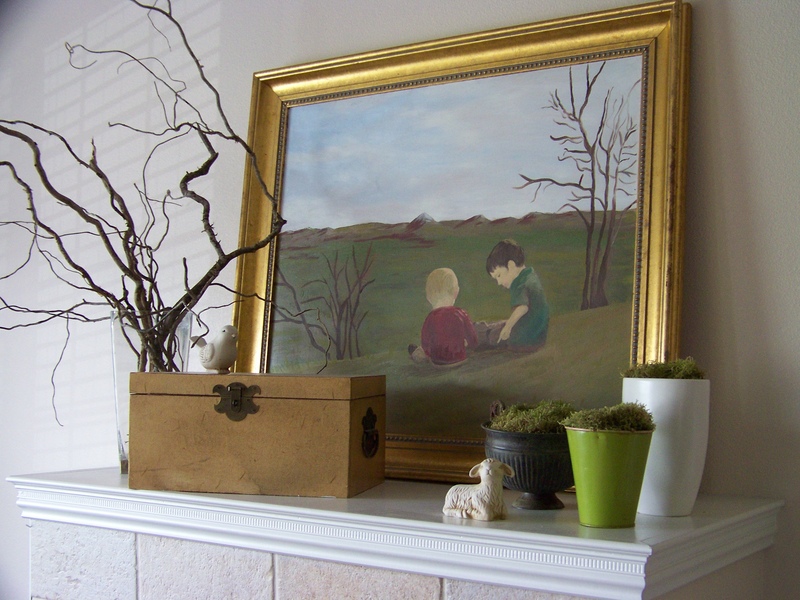 More on re-using items in decorating: old art (frames, canvases, etc.) can get a new life if you have an artistic streak, or are pretty handy with spray paint. 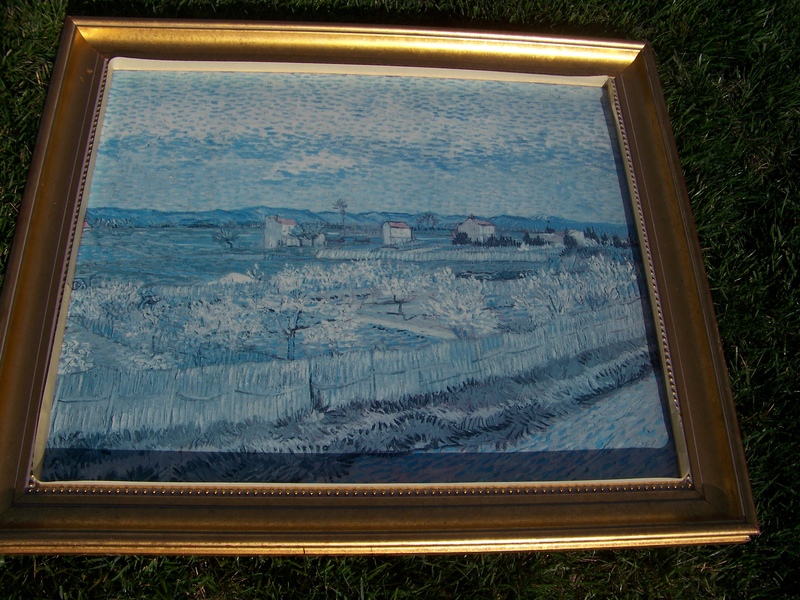 Here is a large framed printed canvas that I bought about 7 years ago at an auction for $5. I had thought that I’d like to use the frame someday, probably repainted. It’s been in the attic all this time. Now 7 years later, I’m OK with the gold frame and the canvas itself gave me inspiration. I know the painting in there is a reproduction of something famous, but it doesn’t go in my house. So I painted over it. First, I masked off the frame from the canvas and applied a coat of Gesso (it’s like primer for art) that I got at Michael’s. Then I used oil paints to paint my picture (I was visiting my sister who is taking lessons and has a whole set of oil paints).This is my first dabble at oil painting. 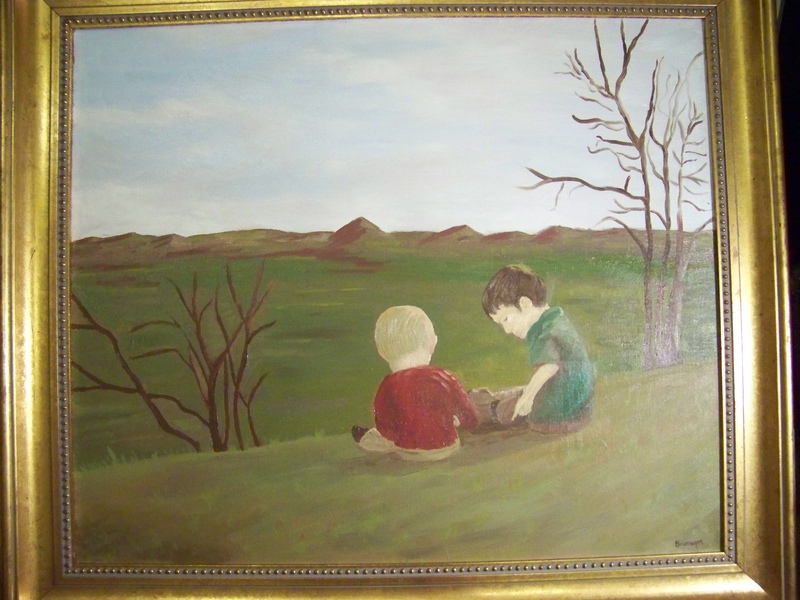 Of course, my boys didn’t sit in that positions as models for hours so I could get the shadows right; so I snapped a photo to refer to as I painted. Here is my photo. First I sketched in the main parts of the picture with pencil, then painted it in. You can see that I changed some of the elements in the photo to be more elegant (no crabby fence). Also: I painted in a well drafted room with the windows open. Novice that I am, I had no idea that oil paintings can take weeks, even months to fully dry. I had to come back home before that time, so we very carefully wrapped the frame in paper and placed a board over it to survive the trip home. Then my new “art” got a place of honor on my mantel. Here it is at Easter time with some spring moss, lamb, and bird. 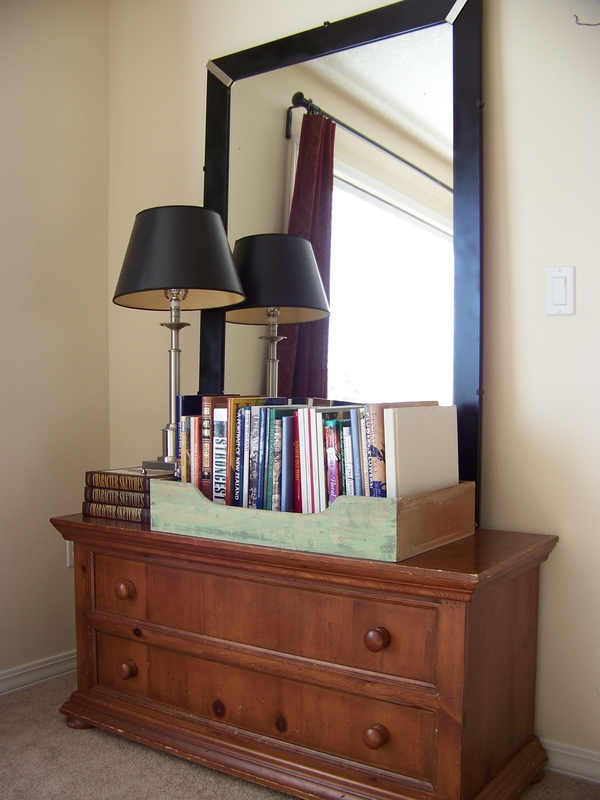 Have you kept an item out of the landfill by repainting or re-purposing it in your home? I’m linking to a blog party on mantels at Funky Junk Interiors. The concept of re-using things is certainly a “green” idea. But it’s not always a “clean” idea, as in non-toxic. Some old pieces of furniture carry an ugly past —mildew, lead paint— that can pollute your home if you bring them in unawares. Check items for signs of mildew (black spotting on wood) and odors. No smoke, mold, or animal smells welcome! 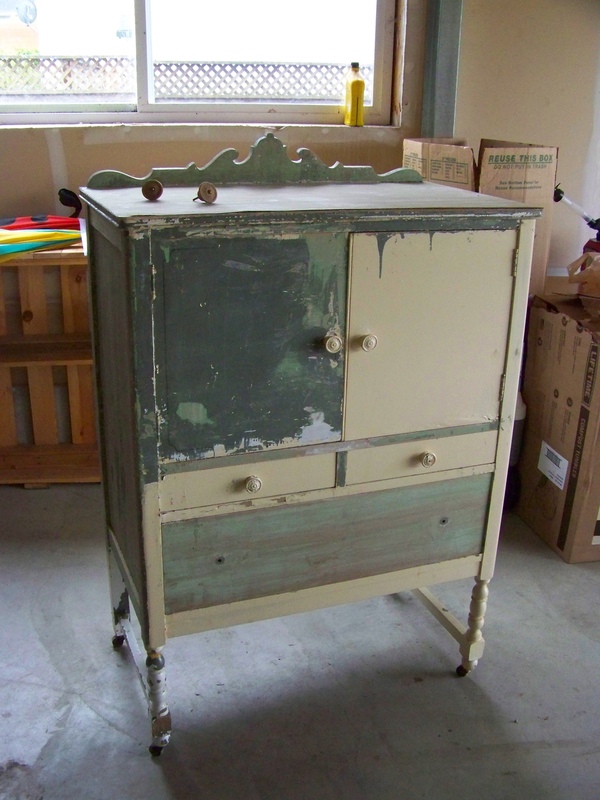 Check for peeling paint/other finishes, and be aware of work involved to restore pieces. There’s a real design trend for “chippy white paint” and “weathered finishes” but these are just asking for home contamination as they continue to wear. 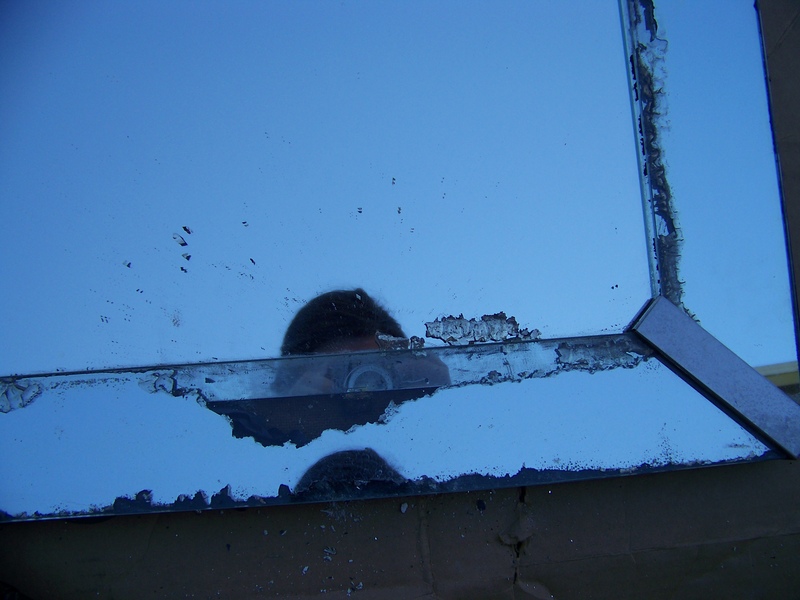 When attempting a restoration project, be aware of the risks involved with both dust and chemical inhalation. Choose low or zero VOC products (paint), apply in a ventilated area, and wear protective gear. Vacuum and wash/scrub all items with a rag and water, vinegar if needed, before bring into your home. Clean up your mess as you go, so paint chips from old furniture, etc. don’t spread around your work area/home. Want to see some of the things I’ve been working on? OK, so it isn’t so cute in this picture, but wait until you see my after photo (coming later…). The lady I got it from had scraped half of the paint off, and was done with the project, so I took over. I love the scraped look of the drawers, so with a thorough inspection and washing I brought them inside. 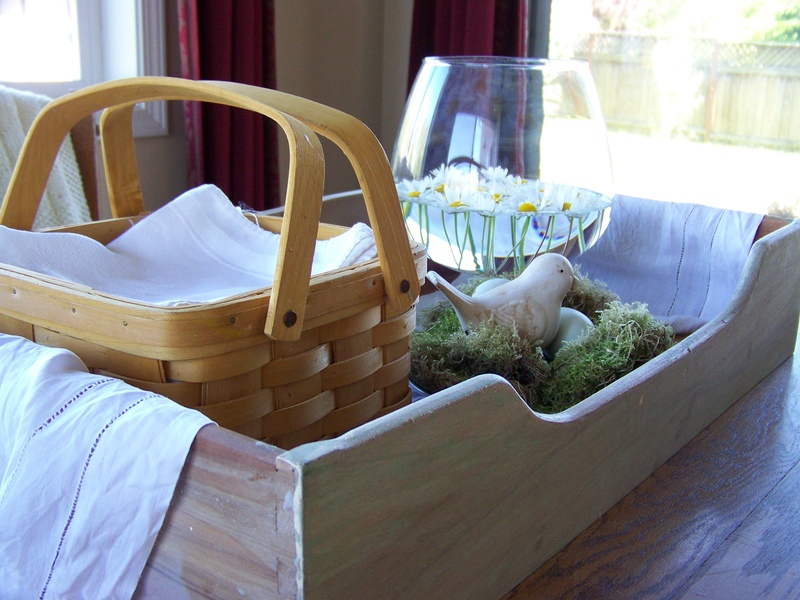 The first drawer is used as a tray on my kitchen table with a basket of napkins and glass bowl of flowers in it. It keeps things a little neater and gives the whole group presence. Here is another drawer, which I’ve used to hold books in the living room. Love how it again gives presence to the grouping, as well as allowing them to be displayed upright on a trunk. Here is another project that I got for free off craigslist (gotta love free stuff). 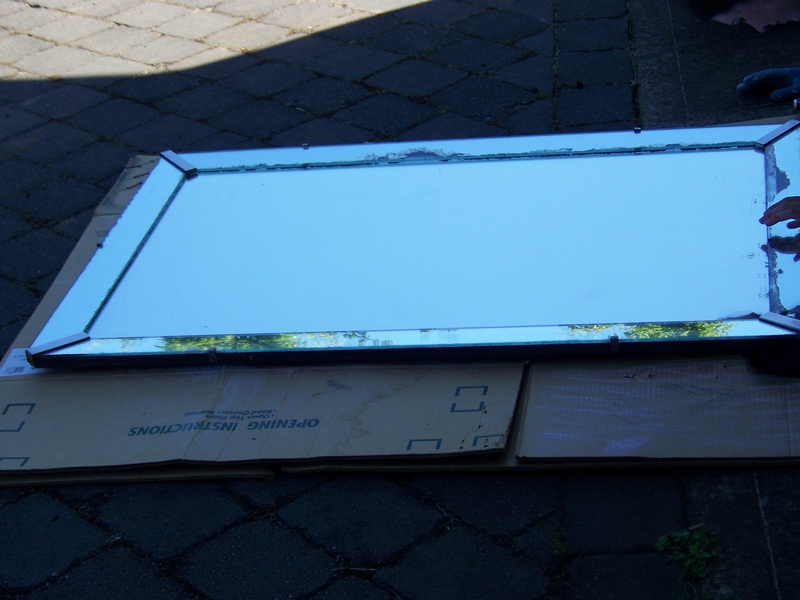 I actually drove over to get this old mirror, and left because it was too decrepit, then thought, hey, free is free, turned around and went back for it. The lady said it had been hanging on the side of the barn. Oh my. Do you see where the mirror backing is peeling from the frame mirror pieces? Here is the finished product in my living room. Amazing, eh? I think so! This was a completely blank corner, so it’s really added a lot to the space. Oh, and here are the books before being covered with paper. Thoughts on the difference? Do you have some fun before and afters from feathering your nest? 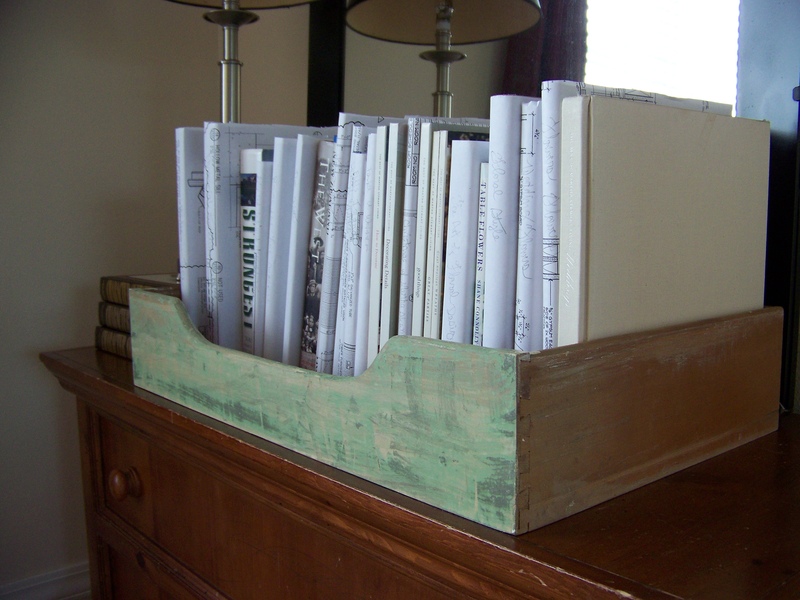 I’m linking to a blog party on uses for old drawers at FunkyJunkInteriors and a linky party for inspiration at TheInspiredRoom. It has to be the mother of all earth-friendly mantras. The idea of leaving less trash behind you on the earth, and using fewer resources, distilled down into three words. Reduce, reuse, recycle. It seems like we’ve seen it printed on the backs of natural products and the front of waste receptacles for years. But do we ever think about what it would look like in our daily lives? I, for one, used to think only of the last word, recycle. Growing up in CA, recycling meant getting money back for aluminum cans. As an adult, the local residential recycling program raised my awareness that glass and plastic should also be recycled. Oh, and paper and cardboard too. My family is now using the third size/type of curbside recycling container supplied to us by our waste management company in the last 8 years (I hope they recycle the other plastic ones! ), and it’s certainly the largest, coming in one third larger than our garbage can. But I’m actually proud to say that we don’t even fill it half full each week (same as with the garbage can). And I’ll tell you why. I’m proud we don’t fill the whole bin because we are doing more of those two first words in the 3Rs: Reduce and Reuse. Recycling is only the last ditch effort to not let something go into a landfill. Before you relinquish it, think of all the ways you might use it. You might call this thinking like Grandma. I have one great-grandmother who immigrated as a mail order bride from Switzerland (she and Grandpa had known each other as children) just before the Great Depression. My grandfather, her son, told me he didn’t think she noticed the depression much since poverty had always been her way of life. When I knew her, she was elderly, but still cultivated every square inch of their city lot for fruit, veggies, poultry, or flowers, and hung out each load of laundry, including carefully rinsed paper towels. Her clothes were patched, and repatched; clean of course. I’m sure she boiled into soup every bone that came across her table (see Bone Broth). 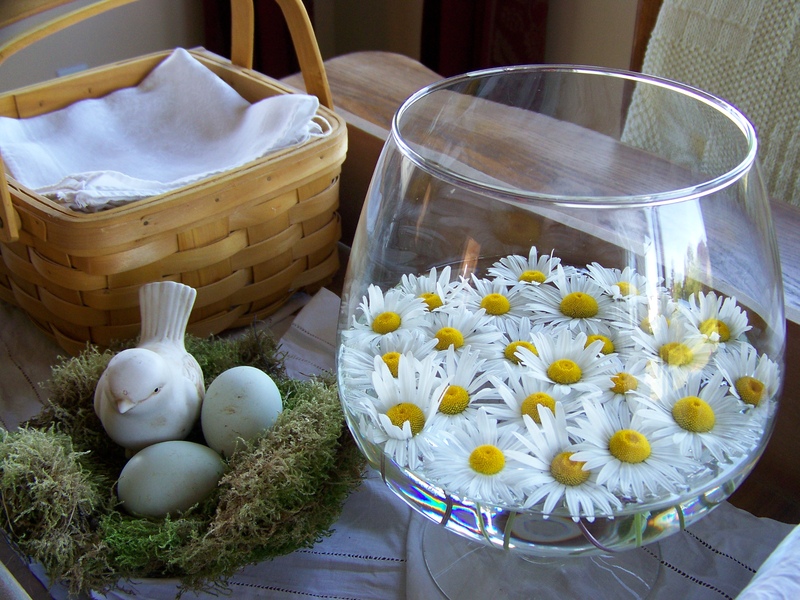 Her back porch was filled with glass and plastic jars and newspapers which she kept for reuse in food storage, gardening, and then would give her overflow of newspapers to the church for fundraiser recycling. She did not see these “reuses” as a sign of poverty, rather as a sign of the great wealth (no hunger) which she and grandpa had been blessed with through their hard work in this land of opportunity. Of course, my other great-grandmothers and grandmothers all lived during the Great Depression, and I can think of ways in which they all were, and those living still are, frugal in their daily habits, including reusing and recycling. Necessity made them reduce, and reusing and recycling were the natural results. We purchase milk and eggs directly from the farms; the egg cartons we return to the farmer, and the glass milk jar is in continuous-loop reuse. I don’t plan to rinse out my paper towels for line drying, but have switched over to cloth rags for most cleaning jobs. They’ll be hung to dry as soon as we can get the lines installed (and the weather accommodates). I have switched to cloth diapers; they also will get line drying soon. However, when traveling I do use paper diapers. I just keep positive by rejoicing about all the waste I’m avoiding during the majority of the time! Even if you aren’t ready to take the plunge into cloth diapers, I highly recommend cloth wipes for use with your baby (see my post on Cloth Wipes for Diapering). Traditional disposable wipes are often laced with dangerous chemicals; going to cloth means you get to choose what cleanser is being wiped onto your baby’s bottom each day. We buy most of our children’s clothing, and some of mine, at resale shops; and I enjoy resaling our cast-offs for credit. I made a patchwork quilt out of a number of old plaid shirts of my husband’s. It turned out so cute that I gave it as a baby gift, and have cut out another from the rest of those shirts to make one for my baby boy. You would be amazed at how much fabric is in a man’s shirt. I’ve been reading about using newspaper for starting a garden bed by covering the sod, then piling it with compost. What a great way to reduce (the need for weed cloth), and reuse (the newspaper). Since there seem to be moisture concerns with weedcloth (and it’s expensive), this seems like a win-win idea for the perimeter beds I’m planning in our yard. We compost all our veggie scraps, non-meat/dairy table scraps, and egg shells. Better dirt, less garbage. I collect all the glass jars which come into our home filled with jam, salsa, marinara sauce, etc. I reuse these when storing smaller amounts of pantry items bought in bulk (beans, popcorn . . . looks so pleasant on the shelves, too!) or leftovers. Glass jars can also be used for culturing dairy or storing frozen liquids, or in the garage for holding nails and screws. My collection of glass jars is beginning to overwhelm my kitchen, so this month I’m going to sort them, and store some in the garage until the summer when I can make lanterns from them to hold tea lights around our back patio. A habit which I need to build is taking my reusable bags into the market weekly. 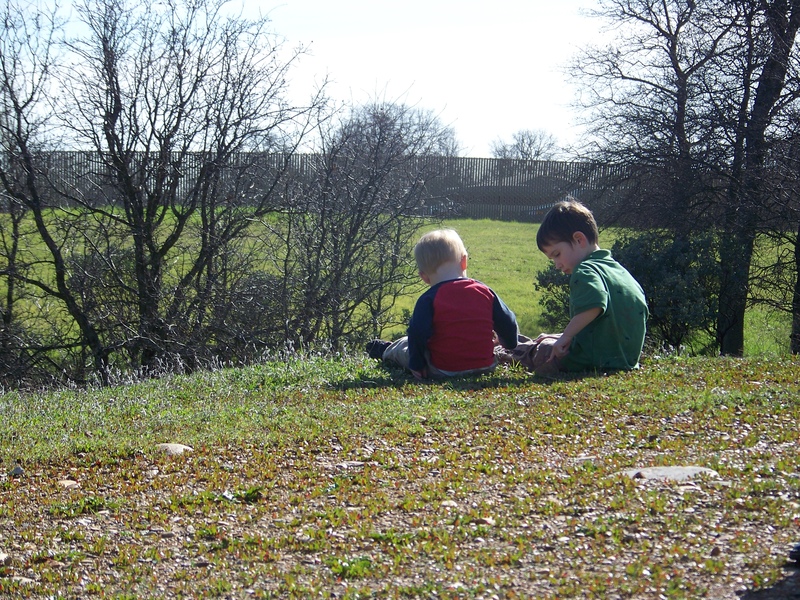 My excuse for forgetting (three children in tow) should be my reason for remembering: start this as a habit in their lives. Nonetheless, when a plastic shopping bag does come home, it gets a second life as a bathroom garbage can liner before ending in the landfill. Making most of our food from scratch, mainly from bulk ingredients or fresh produce, is probably the greatest means of our garbage reduction. Besides having a much greater amount of packaging, and being more costly at the checkout, prepared foods are a drain on your health. Still need the convenience of prepared food? Prepare it ahead yourself: double the recipe size which you normally prepare, and freeze the excess for an easy reheated meal. For salad, wash and chop your salad ingredients when you get home from the market. Keep the oversized salad in the refrigerator all week long, quickly pulling out what you need for a meal, and adding the toppings which you desire on that day (tomatoes should be reserved for cutting until use; they make the salad soggy, and turn mealy in the fridge). 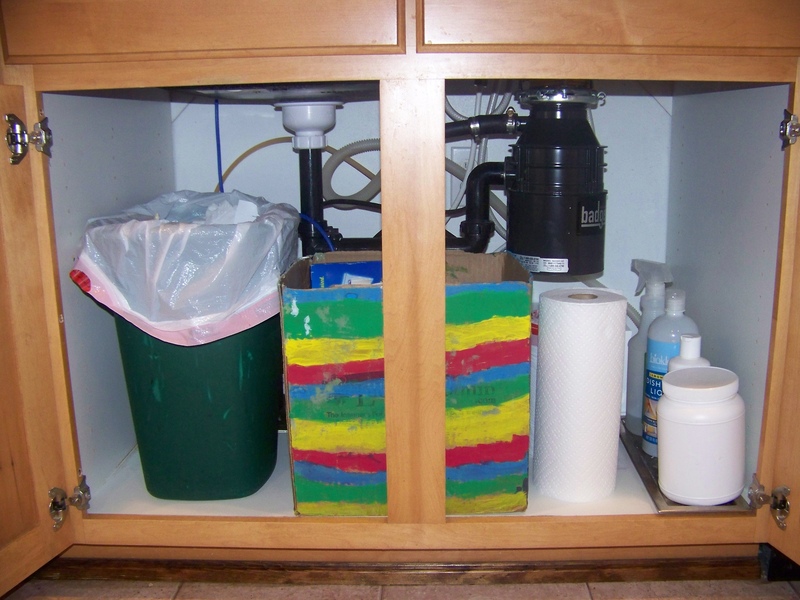 I recently created a place under my kitchen sink for recycles (finally!). Read about it in my post called Creating a Recycle Center. Leave a comment with creative ways you are reducing, reusing, and recycling! It suddenly hit me: I wouldn’t pile trash on the counter waiting for a chance to take it to the garage. I have a kitchen trash can for it. So why am I still piling my recycles on the counter? 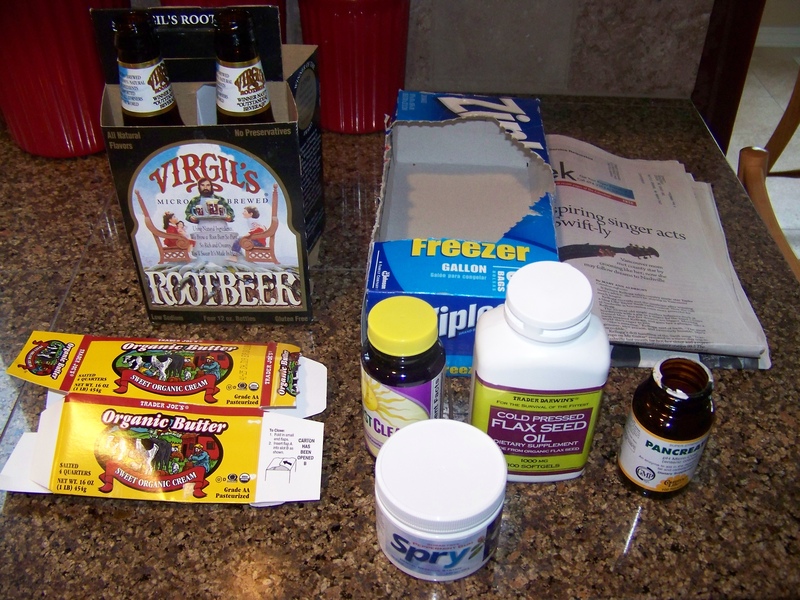 Here’s a picture of my counter, cluttered with recycles: Root Beer bottles, newspaper, ziplocks box, butter box, vitamin bottles, etc. I hate clutter, and I too often have chucked “small” pieces of recycling (junk mail) in the trash because I just wanted to be done with it. 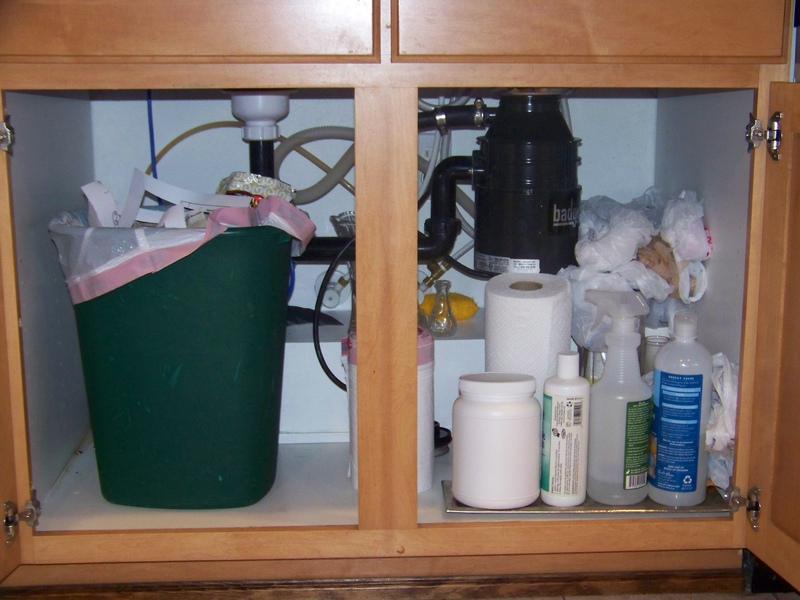 And here is my under-sink area, which I thought was fully used, until I realized what a necessity a recycles bin is. I was storing flower vases under there, stuffed with plastic shopping bags for lining bathroom trash cans. The vases I moved to a high shelf, and the bags I consolidated. Then I rearranged my cleansers and garbage can, and my new recycle bin fits perfectly! The rainbow stripe decoration on the reused shipping box is complements of my two artistic children (6 and 4 years). Here is my newly efficient garbage and recycling center! New habits, new way of life.